Rae and Barry (Baz) Telfer have been waiting more than 14 months for their Level Three Home Care Package. Baz is living with dementia and Rae, his wife and partner of 52 years is now also his full-time carer. “It is heartening to hear announcements from the government at budget time and just this week about increases in the numbers of packages and increases in funding,” Mrs Telfer said. The Level Three package promises the types of support services that will make a difference to the quality of their lives. “The limbo of this promised package is in our minds every day. If we are eligible and we qualify – as all the correspondence from the government has said – then it’s wrong that we have to wait for so long,” Mrs Telfer said. “Living with dementia already is full of changes happening all the time, challenges, stress and uncertainties. We don’t need more uncertainty and when you can’t access that help you’re just left with frustration, helplessness and disappointment. “We’ve had invaluable support from Dementia Australia and the first thing every carer is told is to make sure you look after yourself but to do that you need support – you can’t focus on yourself first because you are so busy supporting the person you are caring for. “As much as I love Baz, I also need to be able to plan some time for myself and my own activities. “Every day I need to be here for Baz to plan our days together, from what and when to eat, what to wear, what’s on for the day and how we are going to get there. The Telfers live in their family home where they both wish to stay together for as long as possible. “Baz and I want to make the most of the time we have together but every day without the support impacts on his ability to live as well as he possibly can in the time he has left,” Mrs Telfer said. Maree McCabe, CEO Dementia Australia welcomes the additional funding of $100 million over two years of the Commonwealth Home Support Program that was announced by Minister Ken Wyatt this week. “This extra funding is much needed as the waiting list numbers for Home Care Packages have increased to over 121,000 people in need of urgent support,” Ms McCabe said. In Australia, there are more than 436,000 people living with dementia and estimated up to 70 per cent live in the community. Dementia is the second leading cause of death in Australia and the leading cause of death of women. “Home Care Packages allow people living with dementia the choice to live in their own homes for longer, can improve their quality of life and reduces the overall cost to the health and aged care system,” Ms McCabe said. “More needs to be done to reduce the waiting time, particularly for people living with dementia so they can make their own decisions about their care before their symptoms impede their capacity to do so. “Appropriately trained and qualified staff are integral to the process to ensure people are being assessed to receive the level of care they need. 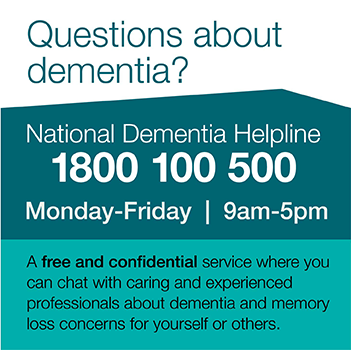 Dementia Australia’s National Collection Day – volunteers needed!